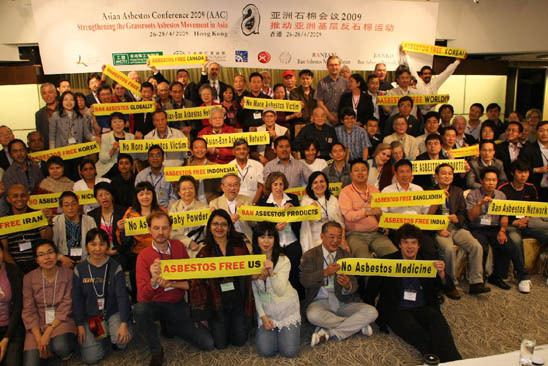 Nearly two years of discussions, planning and organization came to fruition when the Asian Asbestos Conference 2009 (AAC) took place in Hong Kong from April 25-28, 2009. More than 200 hundred delegates from 24 countries joined proceedings which included plenary sessions, workshops, break-out groups, a photographic exhibition, video screenings, trips to examine asbestos contamination of local domestic buildings, demonstrations in Central Hong Kong to mark International Workers' Memorial Day (April 28), media interviews and a press conference.1 Leading ban asbestos campaigners from Asia, Latin America, North America, Europe and Australia joined eminent medical experts, legal professional, trade unionists, technicians and academics to present information on new developments in the global campaign to ban asbestos and obtain justice for the injured. 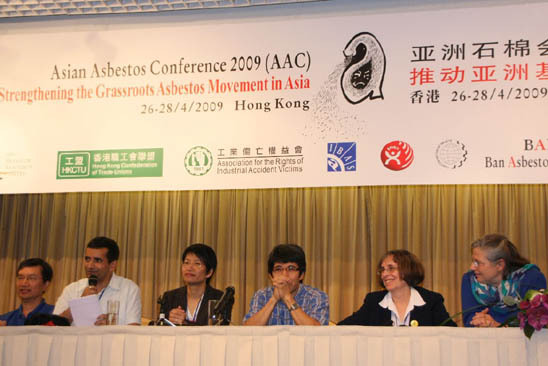 The AAC 2009 attracted considerable support from grassroots asbestos victims groups, labor federations and international organizations. The organizers  the Asia Monitor Resource Center (AMRC), the Hong Kong Confederation of Free Trade Unions, the Association for the Rights of Industrial Accident Victims, the International Ban Asbestos Secretariat (IBAS), the Building and Woodworkers International and the International Metalworkers Federation  were delighted to welcome to the event large contingents from mainland China, India, Japan, Korea and Indonesia as well as representatives from many other Asian countries. During the meeting representatives from the International Labor Organization, the World Health Organization and the International Commission on Occupational Health reiterated calls previously made by their organizations in support of a global ban on asbestos use. As the aim of the AAC 2009 was the strengthening of the grassroots ban asbestos movement in Asia, discussion time was regarded as a key agenda priority. Open forums were held on April 25 and April 27 to enable a free and frank exchange of ideas; as a result of these sessions, a new organization was launched: the Asian Ban Asbestos Association (A-BAN), the purpose of which is to facilitate coordinated action throughout Asian countries on a variety of issues such as asbestos contamination of consumer products, holding negligent multinational corporations liable for tortious behaviour wherever they operate and raising asbestos awareness amongst workers, members of the public, the medical community and governments. A-BAN members come from asbestos victims' groups, trade unions and environmental justice organizations from 16 Asian Pacific countries. Apo Leong, Sanjiv Pandita, Elizabeth Tang, Chan Kam-Hong, Laurie Kazan- Allen and Annie Theboud-Mony.